There are about 50 essential elements our bodies require for everyday health and longevity. They are considered “essential” because our bodies cannot manufacture them; we must acquire them from our diet. Most of these essential elements are vitamins, minerals and amino acids, but two are the essential fatty acids omega-3 and omega-6. Borage oil contains about 40% omega-6, and is an excellent source of this vital nutrient. 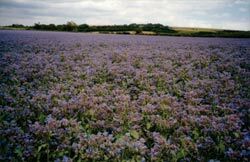 Borage is harvested for its seed, which is processed to extract oil. A good source of omega-3 and omega-6, the essential fatty acids necessary for optimum health, maintaining cell structure and producing energy. Contains high levels of gamma linolenic acid (GLA). GLA improves circulation and hormone balance – ideal for women with PMS symptoms. Borage is more than twice as potent in GLA as evening primrose oil. Enzol’s Borage oil uses both the cold pressed extraction method or the CO2 super critical extraction methods depending on customer’s requirements. Available in 18kg pails or 200kg drums. EPO is a wonderful source of hormone builders. EPO also contains other nutritional lipids such as phospholipids, sterols, and other active phyto-compunds. Independent medical research indicates these compounds are significant immune system and cell builders. A good source of omega-3 and omega-6, essential fatty acids (EFAs) necessary for optimal health, maintaining cell structure and producing energy. Contains about 72% omega-6 and 9% gamma linolenic acid (GLA). Enzol’s Evening Primrose oil uses both the cold pressed, solvent extraction, or the CO2 super critical extraction methods depending on customer’s requirements. EPO is packed in 190kg steel drums. Flax oil is the richest vegetarian source of omega-3 essential fatty acids (EFAs). Omega-3 is regarded by many nutritionists and researchers as a leading therapeutic fatty acid because of it’s importance in aiding the body to maintain healthy cell structure, promote metabolic energy and enhance immune function. Flax oil is also rich in phospholipids, which form cell membranes, promote nerve insulation, and improve immunity. Flax also provides sterols, precursors to many hormonal constituents such as oestrogen and testosterone. The most concentrated vegetarian source of omega-3 fatty acids found in nature. Source of important nutrients such as phytosteriols and beta-sistosterin, as well as phospholipids, which aid the digestion of fats. Contains two times more omega-3 than fish oil. Enzol’s Flax oil uses the cold pressed solvent extraction method. Click here to view the Typical Product Specifications for our Flax Seed Oil.